Amish are well-known for their produce, which they sell at stands and auctions. Produce season is in full swing, with lots of tasty garden treats to be had. You can usually find some great buys for relatively little money. On my recent trip I bought a lot of fruits and veggies from Amish produce stands (to counter the caffeine and other unhealthy stuff I inevitably consume when spending long periods of time in the car). My produce haul over two weeks included masses of tomatoes, peppers, blackberries, a canteloupe and watermelon, peaches, green beans, and so on. 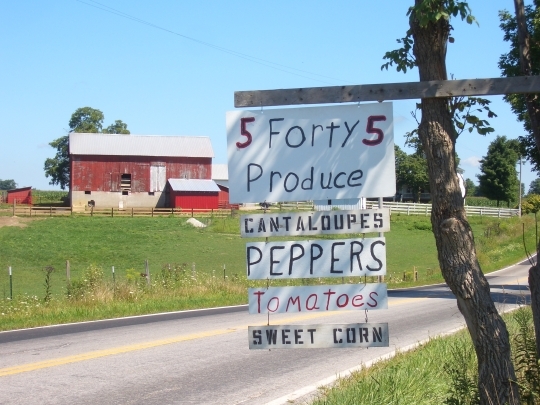 Produce stands are more common in some Amish communities than in others. 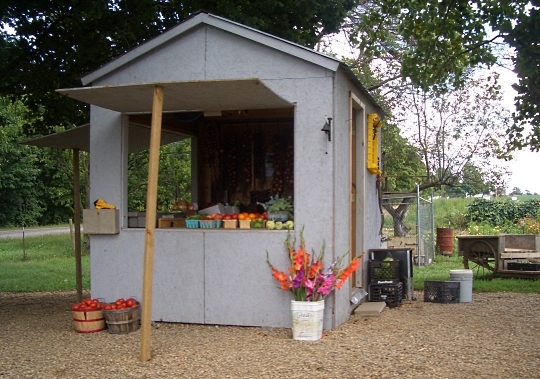 A produce stand is a great way for a family to raise a little extra income. It also gives the children something to do. What do you buy from Amish produce stands? Do you have a favorite? If I recall, Tilsonburg, Ontario, had a nice outdoor vegetable market “downtown” with at least one A/M plain person there. I remember the stuff we bought there tasted so good, but of course we were camping in the area and outdoor life always makes food taste so much better than being indoors all day. I think it was Tilsonburg at any rate. We get our vegetables by buying a share from an Amish owned CSA (Community Supported Agriculture)farm. They are also certified organic! They had a farm day earlier this year when all of the subscibers were invited out to the farm. That was an enjoyable afternoon! 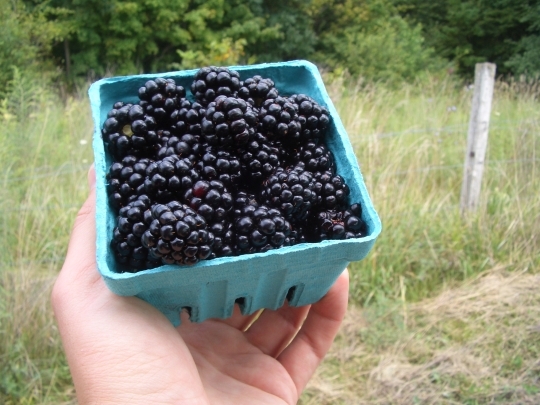 You get spoiled going to the Amish farmstands and getting such big, beautiful, delicious, and cheaply priced fruits and vegetables, and then in between having to buy the same from the supermarket. Most of the time I won’t unless I’m desperate, as how can you compare a small basket of scrumptious, home grown tomatoes for only $2.00 to these scroungy looking things at the supermarket for $1.49 & up per pound? That’s why my husband and I spend every other Saturday driving 1 to 2 1/2 hours to an Amish farmstand or market! You cannot beat their quality and prices. I agree Debbie. Just takes a little more effort (and gas) to go get it. But if you’re nearby, how could you pass some of these goodies up? I really liked the cherry and pear tomatoes I found everywhere. Great car snack. Would you say that hwy 20 that goes from 43 through Summertown, TN to Hohenwald, has a number of Amish families that have produce stands in front? My Wife and myself just love to visit the Amish produce stands where else can you buy furits and vegetables already can in jars all you have to do is pay for them and take home and store them until you are readyo use them it is cheaper to buy that way than to buy the product and can them yourself so just buy already caned item from the Amish and you do not have all the work and mess of canning anything. I bring the produce to really appreciate the freshness and quality. family members is glad to go to the field and pick a fresh supply. garlic, watermelon, winter squash, blackberries, peaches, sweet corn, etc. Besides the produce itself, I thoroughly enjoy the conversations with the families at each farm. It is a real blessing to be able to talk with the persons who planted, grew and harvested the produce that I will have on my dinner table only a few hours after it’s been picked. 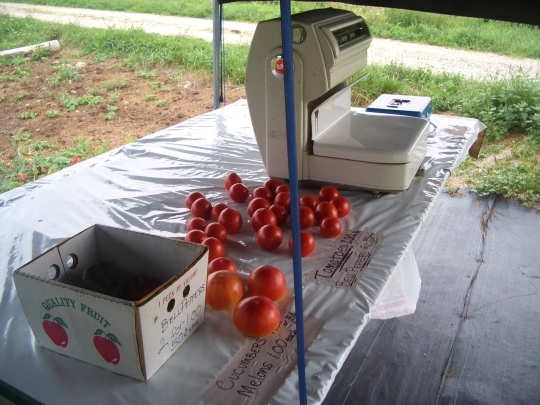 Al I think these produce programs are just going to continue to grow in popularity. People are more health conscious and appreciate small-scale. It’s a great opportunity for Amish as well. Gives a great excuse to get out in the countryside too. We were visiting in DC and the Mennonite farmer market stand had the best produce & other products. We would like to find a similar market in the Central Florida area. We are specifically in Longwood, FL just 20 minutes north of Orlando. Anyone that knows of a farm or stand nearby, please let me know. Can’t help the folks near Orlando, but anyone near Sarasota knows Pinecraft and surronding areas are blessed with Amish produce stands. One is on my way home, making it an easy and enjoyable stop for supplies for dinner. They carry items from a dairy in Arcadia, not officially organic but great — and even sell rich Amish ice cream! I just returned from a weeks trip to Shipshewana Indiana and Holmes County Ohio. It was wonderful and I too love to stop a roadside stands. One stand that I always stop at has the most wonderful pies, and they are just lovely to look at, as well as eat. The farm also has chocolates. She usually makes them later in the year, cooler weather (especially since last week the tempature ranged from 92-97 most days) She made for me special some chocolate cover peanuts clusters..yummy.. I have also bought some home items, such as quilts and decorative items, apple crates, maple syrup, bake goods, flowers and plants. Stop a these stands, you never know what you might find, besides fruits and veggies. And you might just makes some very nice friends along the way. Looking forward to our annual October trip to Holmes County and can’t wait to buy fruit and veggies down there! Also enjoy the flea market in that area. This time we’re staying in a cottage instead of the big Inn where we usually go. Just for something different! My sister and I always stock up on supplies for Christmas baking. One of our favorite times of the year and most likely our last trip before the snow flies! My husband and I are going to take unplanned overnite trip to Centreville, Mi tomorrow. If anyone can point me to anyplace for produce and canned fruit there I’d appreciate it. We just moved in west side of St. Louis from South Florida. We are looking to find Amish fresh produce in Missouri, close to Chesterfield, MO. I don’t mind to drive up to 2 hours just to find one. IF anyone have some suggestion please let me know.